Project Totem is one of those rare games that’s a delight to play and keeps surprising you despite a fairly straightforward concept. A puzzle platformer with a unique gameplay mechanic, this is a game that grabbed us with its instant appeal when we tried it at Gamescom in August. Meeting up with two of the guys at Press Play, a Danish development studio based in Copenhagen, we weren’t just introduced to our namesakes but also got quite a bit of hands on time with their upcoming title “Project Totem”. The basic premise of the game is that you control two characters that represent individual parts of a totem pole – at the same time. In most cases, this means that one character will start at the top half of the screen, with the other at the bottom. Since you’re controlling both character, starting off by pushing your thumbstick to the right means that’s where both characters will go. Sounds easy enough, right? Initially this is indeed the case, as your main challenge is timing your jumps correctly so that neither character falls down or onto a spike – as these are not placed in the same spot for each totem piece. The way the levels are designed, Press Play quickly introduces you to other challenges as well. For instance – the way in which the two characters are aligned might mean that a jump results in one of them jumping to safety, with the other one going head first into a spike. The solution? Backtrack into a wall with one character while the other is still able to move – changing the alignment between the two characters and allowing them to both make the jump. The game teaches you about dynamics like this one step at a time – with the level design and puzzles becoming more intricate as you progress. 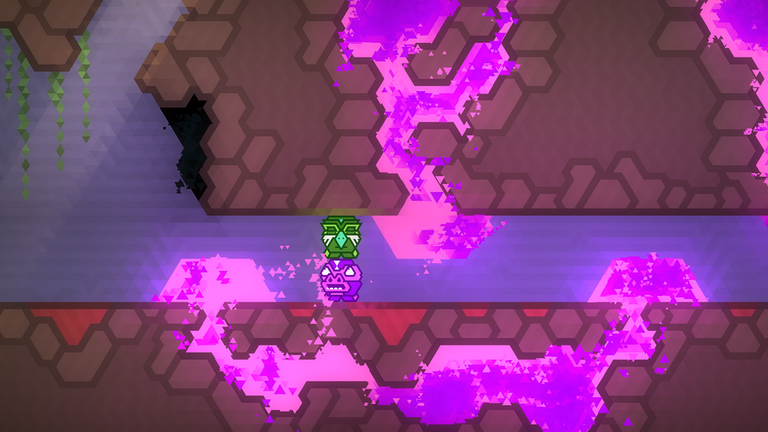 New control mechanisms are also introduced with other totem pieces (that can fly, for instance) or switches that allow you to change color or reverse gravity. We played a variety of levels and were never overwhelmed – which is a credit to the game’s level design. 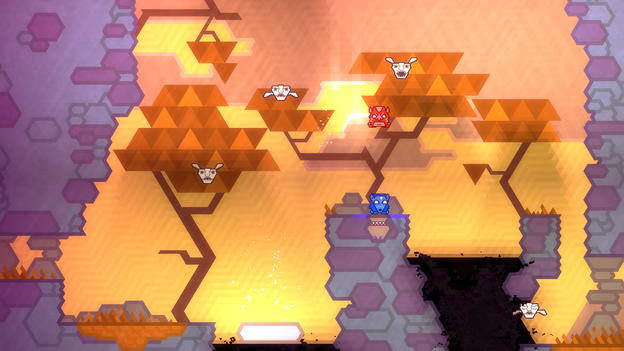 The final game will feature a ton more levels, so we’re looking forward to those. Next to the single player mode, we also played a little cooperative multiplayer, where two gamers each control a totem piece and have to work together in order to traverse the many puzzles specifically designed for cooperative play. This mode turns the game into a slightly more traditional puzzle platformer because you lose the element of controlling two characters at once, but it’s still a worthwhile addition that is close enough to the core experience found in the single player portion. Both modes are presented using the same, somewhat minimalistic, art style. This is a game that is not meant to blow you away with fancy 3D graphics, but one that instead lets you focus fully on the gameplay. The screenshots, therefore, don’t do it justice – this is one of those games that grabs you right away despite a lack of voiceovers, CGI cutscenes and insane polygon counts. Project Totem is coming out for Xbox One (running at 60fps in Full HD) and possibly other platforms and does not currently have a release date.